Peter Harris is still waiting for appropriate wheelchair access. 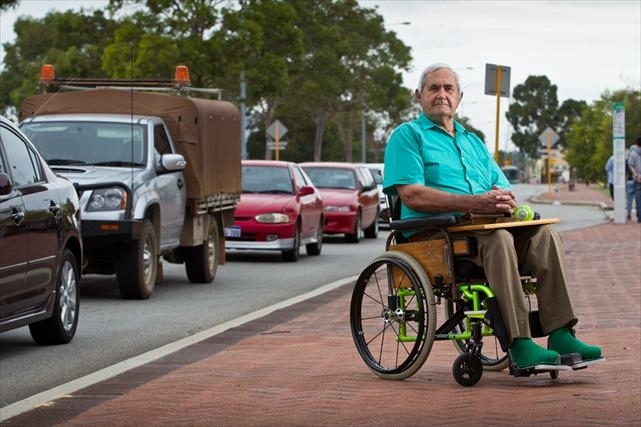 Mr Harris said more than 10 years ago, the council had agreed to construct a wheelchair-friendly lift across the highway which would be suitable for elderly shoppers who were too afraid of crossing the road. He said travelling from one side of the highway to the other was extremely dangerous and people in wheelchairs should have an alternative. Canning Commissioner Linton Reynolds said the council subsequently agreed to a request from Westfield to defer the construction of the bridge. ‘There was a development approval issued by the Western Australian Planning Commission and subsequently by the City of Canning in 1998 for the expansion of Carousel Shopping Centre,’ Mr Reynolds said. ‘A condition of the approval required the design and construction of a pedestrian bridge accommodating disabled access to the satisfaction of the City and Main Road WA. Westfield was unable to comment before the Canning Times went to print. Mr Harris told the Canning Times he was disappointed nothing had been done about the pedestrian bridge and people with a disability and the elderly had not been taken into consideration adequately. Mr Reynolds said the City was aware that further expansion plans for Carousel would be considered by Westfield at some point in the future.